Ever since I was little I’d look at this one book on the shelf: Ahha Kareheha, or, that’s how I read it. We also had “CHEKHOV” which is really confusing, since that’s not even Cyrillic (there is no V like that), but some 1950s book editor who thought it’d be funny to print an English word in somewhat Cyrillic letters. Anyways, that mystery solved finally by cracking it and finding it in English, which led me to the really amazing “Three Sisters,” and also, recognizing sometimes book editors make bad calls. So I read one or two Russian classics in high school, then went to college and read more of them, and learned Russian, and majored in Russian, though I didn’t have the cash- $10,000 – to do a semester abroad in Russia. 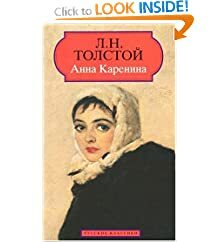 I changed majors, but continued to read poems and plays in Russian, though nothing so ambitious as Anna Karenina (except for the first line, of course). So I’m going to Russia in January! I’ve wanted to go since I read those spines of those books. It’ll be fun, and freezing, and expensive (my vacations are usually pretty cheap). I’m going with my college alumns & students, and teachers, and we even have a syllabus to read beforehand (must check in with the library). Neat fact of the day: in French, Pushkin is Pouchkine. I guess when you’re already transliterating one language, each language will have its own spelling. Written Tuesday, October 28th, 2008 in about writing, language, travel, walk to work. You can leave a response, or trackback from your own site. that's crazy exciting! I had an op to do an exchange semester in Russia in architecture school, but the hubby (now ex-) wasn't too thrilled. I pouted, but later got the low-down from the students who had gone, and I'm glad I didn't. I got my lumps in the military, thank you, didn't need them again. take a super huge memory card for your camera!! Oh I will- good reminder :) I'm excited about shopping for nice winter clothes, to be honest. Russia in winter seems “real” to me, and kinda exotic, being a Californian.